Legend has it that College founder Henry Durant once declared, "pies, lies, and doughnuts should never have a place in Wellesley College," so students who wanted a chocolate fix decided to hone their fudge-making and baking skills in secret. The result of these early efforts was a decadent square layer cake topped with a slab of fudge frosting. Over time, local tearooms put the cake on their menus, and Baker’s Chocolate (now owned by Kraft) included the recipe with bars of its baking chocolate. 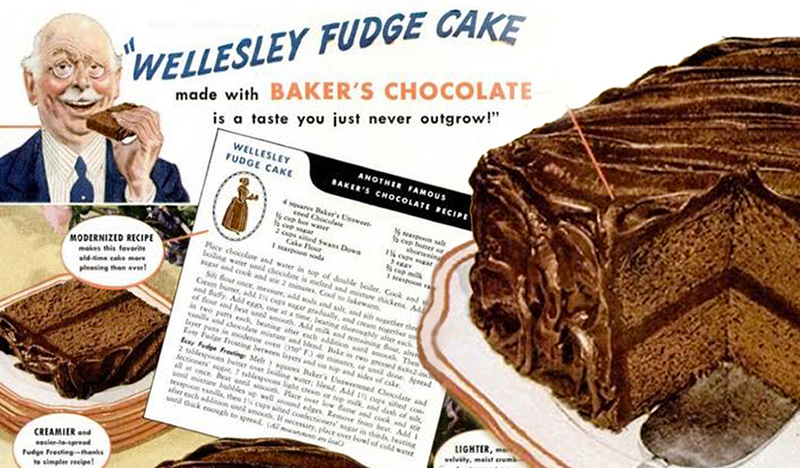 Our social media pages have been abuzz with comments from fans of Wellesley Fudge Cake—also known as Wellesley Chocolate Cake—since the College's Facebook, Twitter, and Instagram accounts mentioned that surreptitious treat on January 27, National Chocolate Cake Day. In 2010 Cook’s Country magazine tested several recipes for the labor-intensive cake and developed a modernized version to appeal to a more contemporary palate. Said the magazine, "Nowadays, we’re so accustomed to ramped-up chocolate flavor and silken ganaches (not to mention high-quality chocolate), the cake failed to make the impression it once did." The Cook's Country testers replaced some of the bar chocolate with cocoa powder bloomed in hot water, in order to deepen its flavor. They also replaced "thick sour milk" with buttermilk to give the cake a hint of tang, and they simplified the frosting. (The Cook’s Country recipe is available online.) Yet for many who love Wellesley and Wellesley Fudge Cake, earlier versions of the recipe, including two from alumnae, are worth the effort. Mark your calendar—and choose your preferred recipe—for next year’s National Chocolate Cake Day, January 27. In the meantime, share a Fudge Cake memory with us on Facebook, Twitter, or Instagram.